← NACCHO News Alert: Has Government policy on remote Aboriginal communities failed ? Welcome to the Aboriginal and Torres Strait Islander suicide prevention information survey. 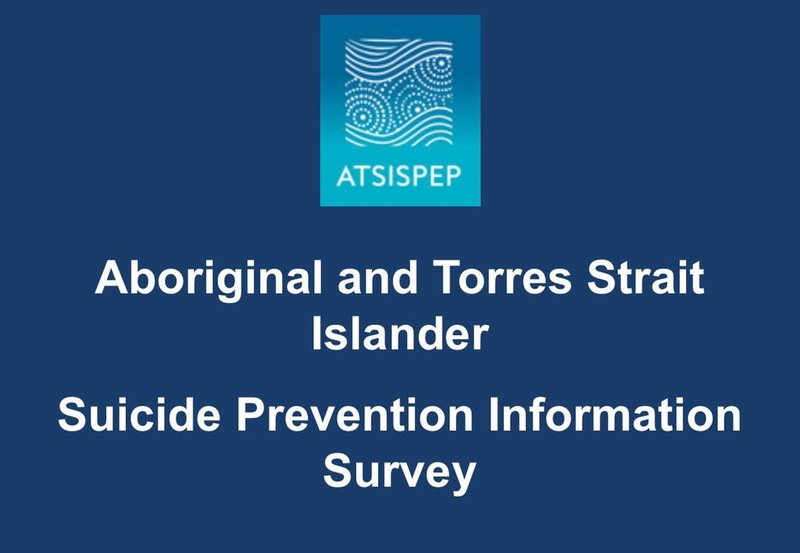 This survey is being conducted for the Aboriginal and Torres Strait Islander Suicide Prevention Evaluation Project (ATSISPEP) – a national research project at the University of Western Australia (UWA) in partnership with Telethon Kids Institute that is responding to the high levels of suicide in Aboriginal and Torres Strait Islander communities. ATSISPEP is developing a strong evidence base on effective programs, services, resources, training and other initiatives directed at Aboriginal and Torres Strait Islander suicide prevention across Australia. This survey seeks your feedback, responses, and insights about any experiences you may have had with a range of suicide prevention programs, services, training and resources– either personally or in your professional capacity. The information you provide will help guide and further inform our project and strengthen its findings. The survey takes around 10 minutes to complete and is completely anonymous. Please contact the team at Telethon Kids Institute if you have any queries about the survey, or if you would like to discuss anything further with the ATSISPEP team. Thank you for your interest and participation in what we hope will be a valuable information gathering exercise. Three federal government ministers will sit down with Indigenous leaders and mental health advocates on Wednesday to tackle Indigenous mental health, which they say is the nation’s “most confronting health challenge”. Health Minister Sussan Ley, Assistant Health Minister Fiona Nash and Indigenous Affairs Minister Nigel Scullion will meet 17 mental health advocates and seven respected Indigenous health leaders at Parliament House to discuss reducing the suicide rates of Indigenous people and associated mental health issues. “The focus of the roundtable will be on how we can best reduce the incidence of mental health conditions and suicide, and improve social and emotional wellbeing among Aboriginal and Torres Strait Islander people,” Senator Scullion said. “Indigenous health remains this nation’s most confronting health challenge, with mental health issues in need of urgent attention. We want this meeting to develop some clear, positive strategic direction,” he said. Suicide death rates among Indigenous and Torres Strait Islanders are more than double those of non-Indigenous people living in the same areas. For people aged 25 to 34, the suicide rate almost triples compared with non-Indigenous people. “Successive governments have invested heavily in culturally appropriate health programs for Indigenous Australians and, while we have had some success with improvements in life expectancy, especially with the decline in child death rates, the incidence of suicide is a continued concern and we must all work toward a coherent, national approach that more rapidly tackles these issues,” Ms Ley said.